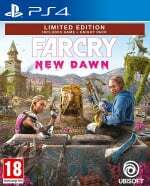 Congrats if you guessed that Far Cry: New Dawn would release before RAGE 2 next year, because it will. Ubisoft's next open world adventure is due to launch on the 15th February 2019, and it'll hit with the lower price point of $39.99 rather than full retail. The game got its first trailer at The Game Awards 2018, and it looks... Well, it looks like Far Cry set after a nuclear bomb or two has gone off. Are you looking forward to this one? Pray for RAGE 2 in the comments section below. Like you said, it just looks like a post-nuke Far Cry. Since it's obviously a spin-off I wasn't really expecting anything drastically new but it doesn't look anywhere near as inventive as Blood Dragon or Primal. Just looks like Far Cry 5 with a bit of Rage 2's silliness injected into it. Since I haven't even finished FC5 I can't say I'm finding myself at all interested. The box art is awful, but the gameplay does look fun and wacky. That's gonna be a hard pass from me. Unless I'm missing something major this looks totally looks like an FC5 cheap asset flip. Too big for dlc, not big enough for a full retail release. Looks like it's going to be Rage 2 if I want to get my post-apocalyptic-rocks off. Well....I've loved all the Far Cry series so one more wouldn't hurt . So that's just a simple copy of Rage 2, there's even pink everywhere ! What the hell ? Can’t wait! #5 was my first Far Cry. I’ve since played the earlier titles, but super excited to revisit Hope County! Looking forward to it, probably moreso as it's a direct sequel. I enjoyed FC5, but have to say the ending left me feeling a bit deflated, almost as if it was unfinished. I enjoyed the FC5 DLCs less and less with each one; loved the Vietnam one, would have loved the Mars one if not for Hurk/Brobot's constant jabbering, and wasn't overly keen on the zombie one... haven't even finished it. This, though... this should be enjoyable. Great price point, too. I enjoyed FC5, but I'm not sold on this. Looks like DLC and has a sort of "design by committee" feel to it. Are the twins the protagonists? If so that's a huge issue. I like my player characters quiet in these kind of games. No wonder their games aren't highly anticipated enough. Ubisoft release faaaarrr too many games. If all the efforts put in this was added to Primal and 5 and released as a single Far Cry, I'm sure it would be 90+ on MC. Same with AC, they aren't Sports that need updates on kits, transfers, boots so you can have the excuse to release every year c'mon Ubisoft. Yeah this looked kinda crap imo. Very underwhelming. The February 2019 release is a very pleasant surprise. I can then go from RE2 to New Dawn. Outstanding! Stupid fun is what i like and Far Cry 5 and Arcade served huge portions of fun for me. I did pass on the dlc as it looked less interesting than playing the free Arcade mode. This video shows someone about to pet a huge Razorback. A pet Razorback? Now that sounds like fun. So it's pretty much an expansion for Far Cry 5. Well, at least Ubi is selling it for $40, and not $60. looks like sooo many other ubi games. i see the fauna survive the apocalypse to no doubt be turned into bigger gun holsters. I enjoyed FC5, so this is kind of interesting. If I have nothing to play in February then I'll buy. For me the series peaked with 3 and blood dragon. For some reason I recoile at every entry since then. It seems they always want to stir up more controversy with each sequel.